Catheter-directed thrombolysis has the best results in patients with a viable or marginally threatened limb, recent occlusion (no more than 2 weeks’ duration), thrombosis of a synthetic graft or an occluded stent, and at least one identifiable distal runoff vessel. Surgical revascularization is generally preferred for patients with an immediately threatened limb or with symptoms of occlusion for more than 2 weeks. Heparin should be administered as soon as the diagnosis has been made. In a patient with a viable or marginally threatened limb, imaging studies (duplex ultrasonography, CTA, or MRA) can be obtained to guide therapeutic decisions. 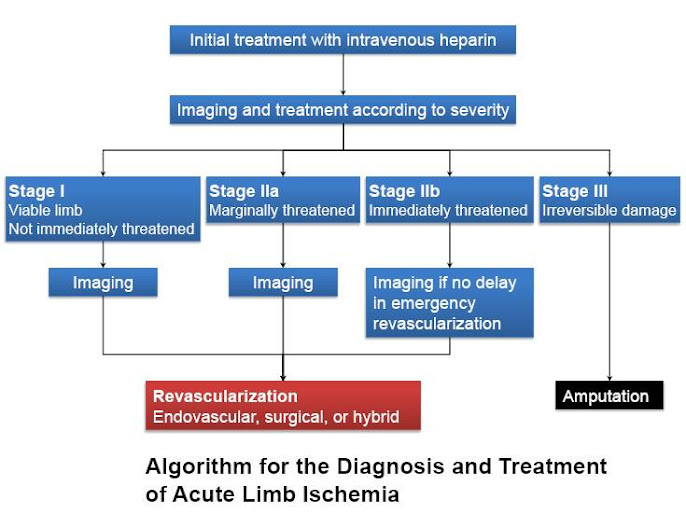 In a patient with an immediately threatened limb, such as the patient described in the vignette, emergency angiography followed by catheter-based thrombolysis or thrombectomy or open surgical revascularization is indicated to restore blood flow and preserve limb viability.